. 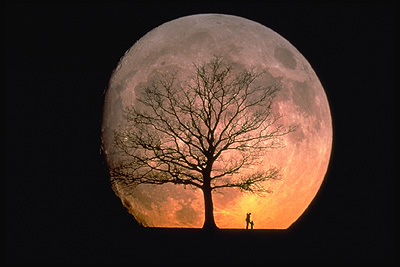 During a lunar eclipse the initially full Moon passes through the Earth's shadow. 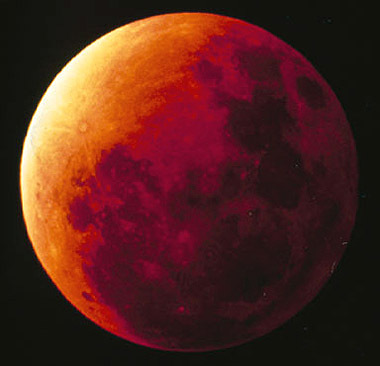 A total lunar eclipse occurs when the entire Moon moves into the umbra. Because no portion of the Sun's surface can be seen from the umbra, it is the darkest part of the Earth's shadow. Only part of the Sun's surface is blocked out in the larger penumbra. 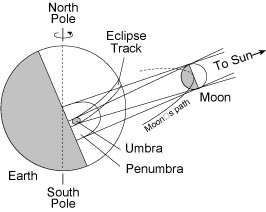 A partial lunar eclipse occurs when the Moon's orbit takes it only partially through the umbra or only through the penumbra.
. The Moon's orbit is titled 5 degrees to the Sun's route across the sky, the ecliptic, allowing these paths to cross at two nodes. These are the only points at which eclipses can occur. During a lunar eclipse the Moon and Sun are located at opposing nodes, so that the Moon can move into the Earth's shadow cast by the Sun. A solar eclipse occurs when the Moon and Sun cross paths at the same node.
. During a solar eclipse, the Moon casts its shadow upon the Earth. 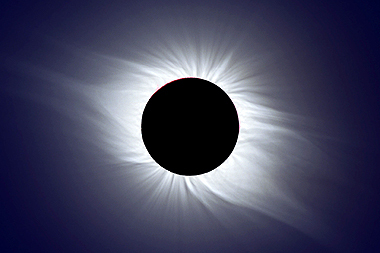 No portion of the Sun’s photosphere can be seen from the umbral region of the Moon’s shadow (small gray spot); but the Sun’s light is only partially blocked in the penumbral region (larger half circle). A total solar eclipse, observable only from the umbral region, traces a narrow path across the Earth’s surface.
. We make judgements about size because of our perceptions of distance. The two black disks in this figure are the same size, but we see the bottom one as smaller because we think it is closer. The top disk seems larger because it appears to be farther away. The Moon on the horizon is similarly thought to be huge because comparisons with objects on the ground make us think it is far away - see Fig. 5.6. When people look straight up at the Moon, in an otherwise empty sky, they no longer have land clues to compute the Moon's distance and it is perceived as being closer and smaller.
. Expeditions to the Moon created a new image of the Earth as a blue and turquoise ball suspended all alone in the dark chill of outer space, light and round and shimmering like a bubble, flecked with delicate white clouds. 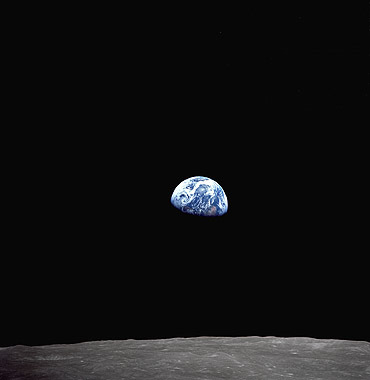 This image was taken from the Apollo 8 spacecraft in 1968. (Courtesy of NASA.).
. 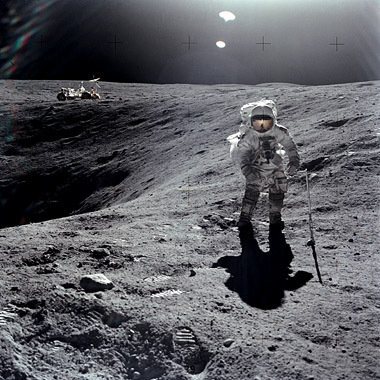 The six Apollo (A) landing sites were located in safe places near the equator on the near side of the Moon. Within this constraint, the sites were designed to obtain samples from a wide variety of terrain. 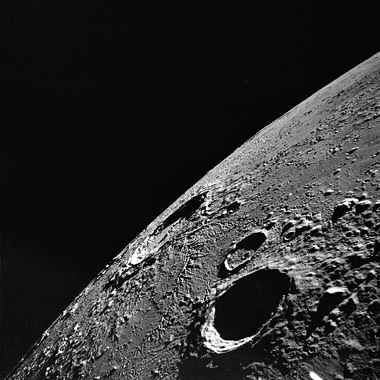 Apollo 11 and 12 respectively landed on Mare Tranquillitatis and Oceanus Procellarum. 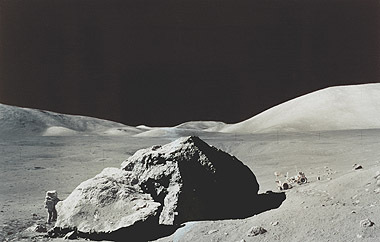 The spot chosen for Apollo 14 was the Fra Mauro Formation, which is covered with material ejected during the ancient impact that created the Imbrium Basin. By landing at a point just inside the Apennine Mountains, the Apollo 15 astronauts could sample highlands, maria and the Hadley Rille. 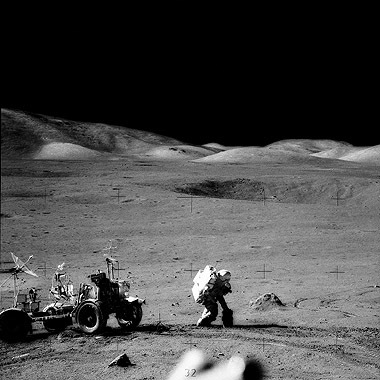 The Apollo 16 mission sampled the highlands near crater Descartes, while Apollo 17 landed near Mare Serenitatis. 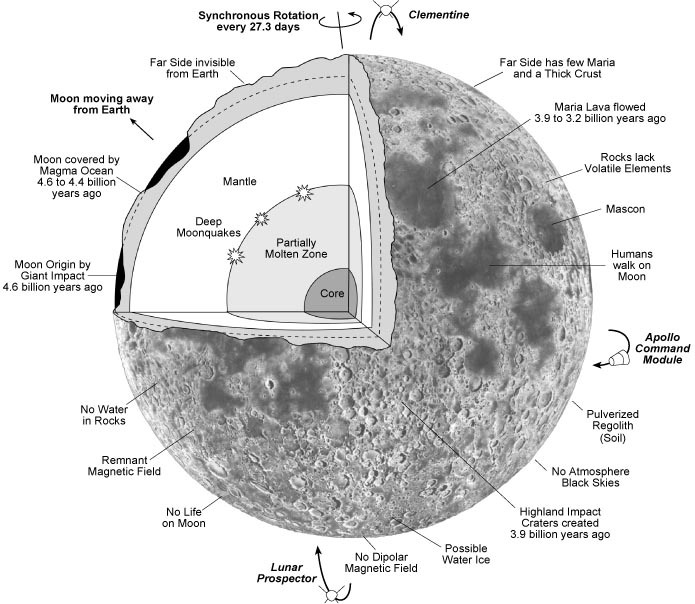 The location of the three Soviet Luna (L) unmanned, sample return sites are also shown.
. A schematic cross section of the Moon shows its internal structure. 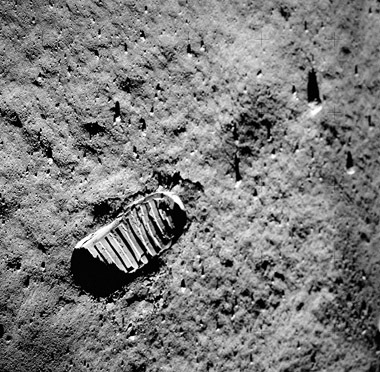 The lunar crust is thinner on the near side that faces the Earth, and thicker on the far side. Fractures in the thin crust have allowed magma to reach the surface on the near side, where the lava-filled maria are concentrated. 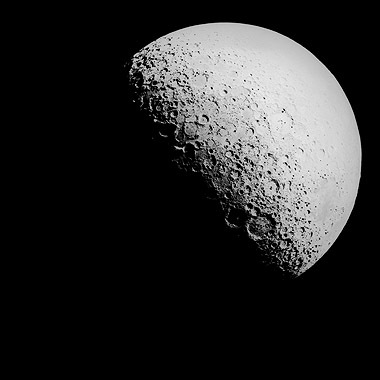 The Moon has an iron-rich core with a radius of about 20 percent of the Moon's average radius. 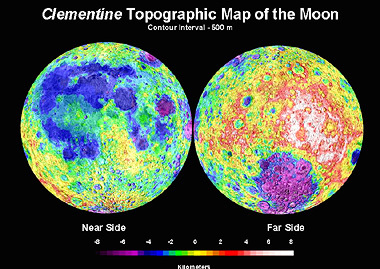 The Moon's center of mass (CM) is offset by 2 thousand meters from its center of figure, CF, so an equipotential surface, which experiences an equal gravitation force at all points, lies closer to the lunar surface on the hemisphere facing Earth. 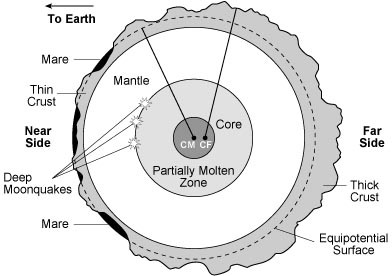 Therefore magmas originating at equipotential depths will have greater difficulty reaching the surface on the far side.
. 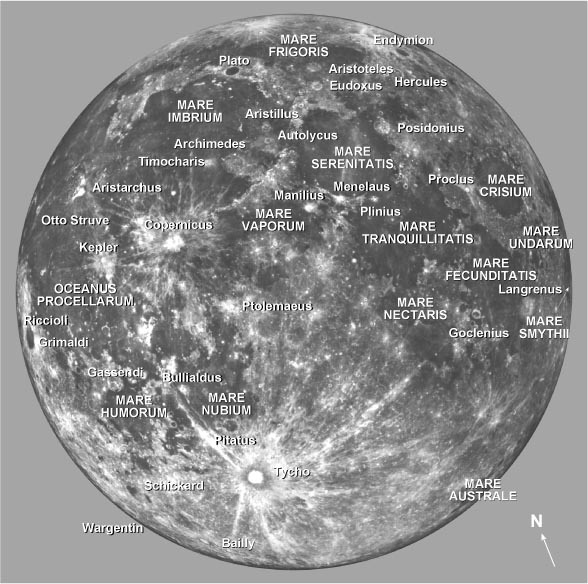 The near-vertical orientation of the Moon's north-south rotation axis to the ecliptic plane creates permanent night and a permanent deep freeze at the floor of craters located at the lunar poles. These regions might be reservoirs of water ice, delivered there by comets. The angle between the Earth's equator and the ecliptic, or the plane of the Earth's orbit around the Sun, is 23.5 degrees, and this tilt produces the seasons. The Moon provides a steadying influence for the Earth's tilt, keeping it from varying widely and producing dramatic climate variations. Also note that the plane of the lunar orbit falls neither in the Earth's orbital plane nor in the ecliptic.
. 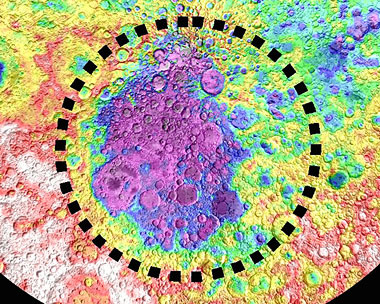 The rate of forming craters on the lunar surface is plotted against time. 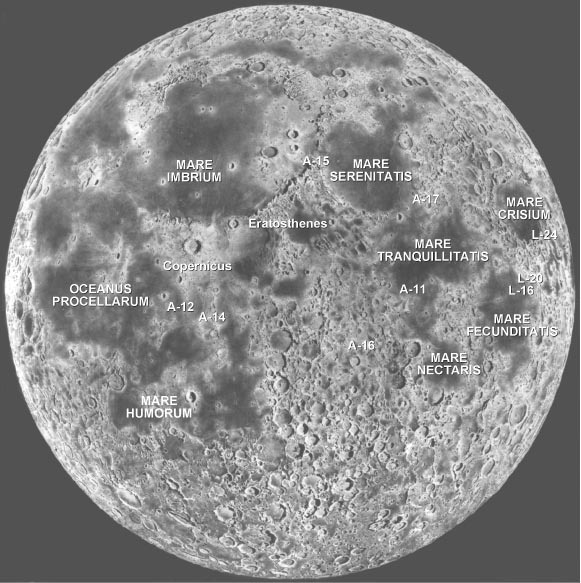 The arrows point to the crater rate and rock ages at various Apollo landing sites. 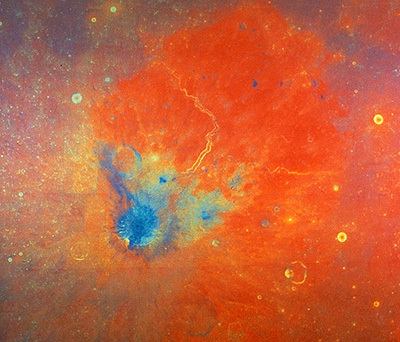 The crater rate was very high during an intense bombardment that occurred 3.9 billion years ago. 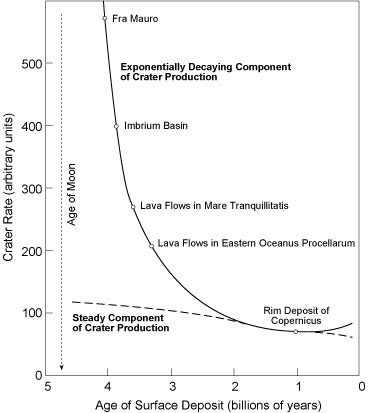 The rate dropped rapidly during the subsequent billion years, giving way to the lower steady rate of crater production that has persisted for the last 3 billion years. 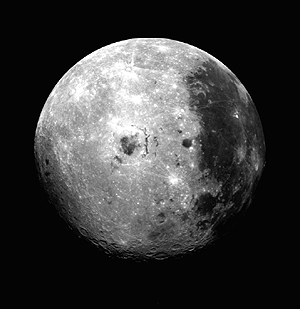 With such a curve, we can obtain approximate surface ages just by counting the number of craters in different parts of the Moon. Recent data have provided evidence of an increase in the cratering rate over the last 400 million years.
. Disintegrating and vaporizing as it strikes, a meteorite blasts a huge impact basin out of the lunar surface (left), while the associated shock waves create fractures in the rock beneath the basin. 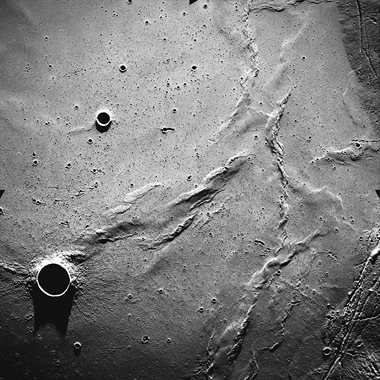 The blast hurls up mountain ranges around the basin (middle), and the underlying rock adjusts to the loss of mass above it by rebounding upward. The uplifted mantle causes additional fractures in the rock, while a pool of shock-melted rock solidifies in the basin. 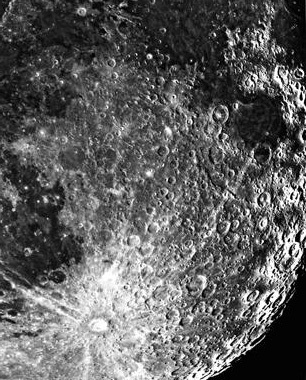 All the major impact basins on the Moon were created in this way between 3.9 and 4.3 billion years ago. 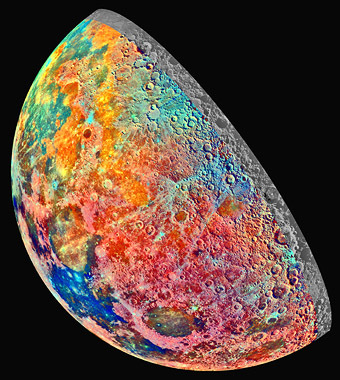 Later, interior heat from radioactivity caused partial melting inside the Moon, and magma rose along the fractures, filling the basin with layer by layer with lava to form a dark mare (right). The lunar maria were fill by this volcanic outpouring between 3.1 and 3.9 billion years. ago.
. The Moon's gravitational attraction causes two tidal bulges in the Earth's ocean water, one on the closest side to the Moon and one on the farthest side. 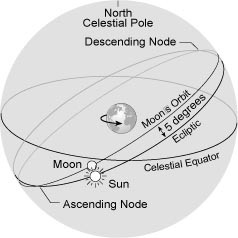 The Earth's rotation twists the closest bulge ahead of the Earth-Moon line (dashed line), and this produces a lag in time between the time the Moon is directly overhead and the highest tide. The Moon pulls on the nearest tidal bulge, slowing the Earth's rotation down. 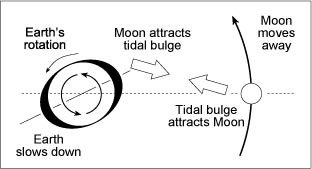 At the same time, the tidal bulge nearest the Moon produces a force that tend to pull the Moon ahead in its orbit, causing the Moon to spiral slowly outward.
. 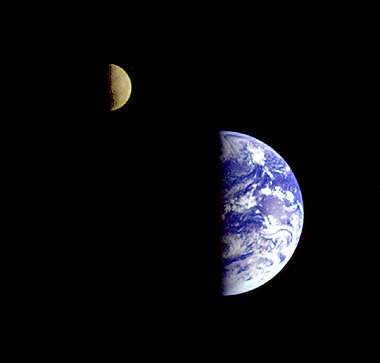 The height of the tides and the phase of the Moon depend on the relative positions of the Earth, Moon and Sun. When the tide-raising forces of the Sun and Moon are in the same direction, they reinforce each other, making the highest high tides and the lowest low tides. These spring tides (left) occur at new or full Moon. 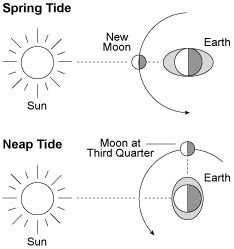 The range of tides is least when the Moon is at first or third quarter, and the tide raising forces of the Sun and Moon are at right angles to each other. The tidal forces are then in opposition, producing the lowest high tides and the highest low tides, or the neap tides (right). The height of the tides have been greatly exaggerated in comparison to the size of the Earth.
. 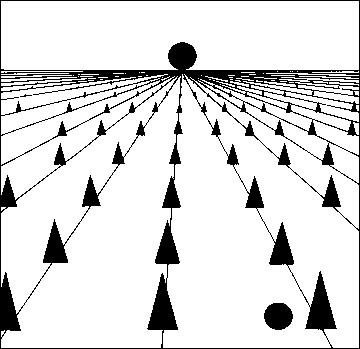 According to the fission theory (left), the rotational speed of the young Earth was great enough for its equatorial bulge to separate from the Earth and become the Moon. In the capture theory (middle), a vagabond moon-sized object once passed close enough to be captured by the Earth's gravitational embrace. We have pictured disruptive capture, with subsequent accretion, but the Moon might have been captured intact. 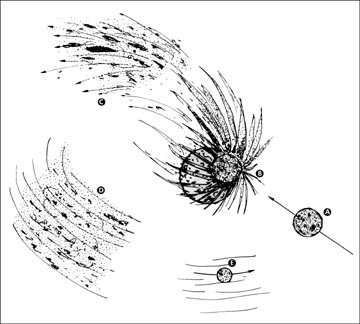 The accretion theory (right) assets that the Moon formed from a disk near the Earth.